Even though I’ve been eating and cooking vegetarian food for decades, I still feel an uncomfortable twinge of anxiety when I’m having a vegan for dinner. Cooking a simple vegan meal is not a problem but when it comes to creating a lavish dinner party spread of food without resorting to any eggs or diary products, I tend to feel a bit creatively stumped. I’ve never been one to give dinner parties that are structured around a formal three-course meal; it’s not a style of eating that I think is particularly well suited to vegetarian food. My dinner parties always tend to be rather ramshackle affairs, with lots of different dishes crowded onto the table and where people pick and choose what and how much they want to eat. I always make too much food and there are always leftovers (usually lots of leftovers). In amongst this profusion of food, there should always be enough vegan options – but that still not enough for me: I want my vegan dinner guests to be able to create a plate that is a satisfying feast of different textures and complementary flavours. 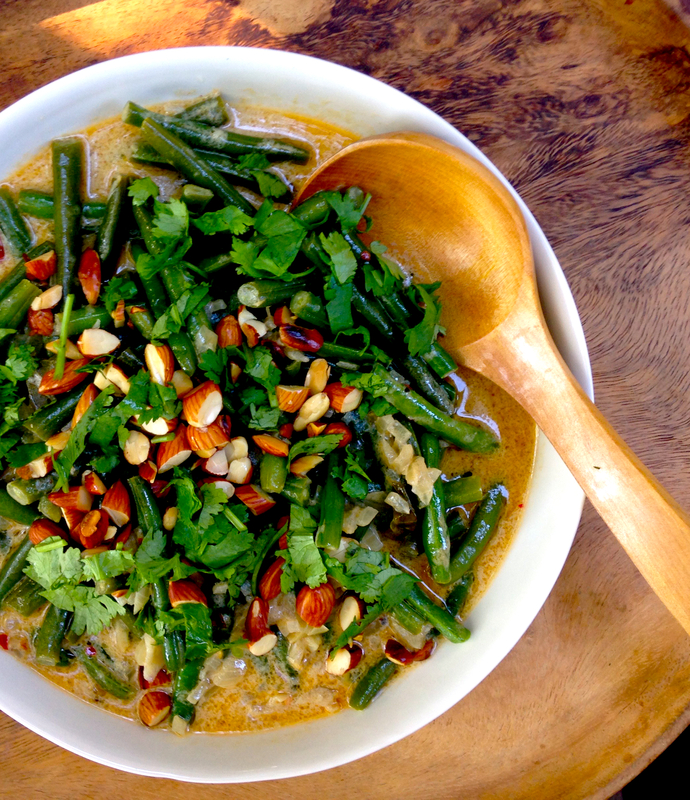 I first made this green bean masala last year, when I was having vegan friend to dinner, and I was having all my usual anxieties about vegan dinner guests. I’d decided to make Indian, which would seem to an easy conversion (I don’t use ghee) but I still worried about the lack of yoghurt, which for me provides the perfect counterpoint to the spiciness of Indian food. (Hindus don’t revere their cows for nothing). This Bihari green bean masala is rich and lavish enough that it’s perfect to build a vegan feast around. It’s simply spiced and incredibly easy to make, using just cumin, coriander, sweet paprika and chilli flakes, basic spices that you probably already have on hand. You could just serve it by itself with rice and make it a simple meal but I always serve a dahl with it and then, to offset the richness, a simple chopped Indian style salad of tomato, cucumber, onion dressed with lime or lemon juice. If you add another vegetable dish (a dried spiced cauliflower or potato dish works well with the two wet dishes), open jar of lime pickle and, if you’re feeling really ambitious, fry some pappadams, you will have a feast that should satisfy your most discerning vegan friends. I shouldn’t really complain about vegans coming to dinner, veganism has been around for quite a while and it has something of the known and familiar about it. You could always have a paleo-vegetarian (yes, they’re out there) or no-carb raw foodist coming to dinner… now that would really send me into a spin. This recipe comes via one of my favourite food blogs: The Wednesday Chef and is originally a Julie Sahni recipe from the New York Times. I’m a big fan of Julie Sahni – her Classic Indian Vegetarian and Grain Cooking is one of my favourite cookbooks. You can also use this basic recipe and substitute other vegetables – such as cauliflower, carrots or eggplant (The long thin Japanese eggplants are best for this) – cut the carrots and eggplant on the diagonal in 1 inch slices and the cauliflower into 1½ inch florets and adjust the cooking time accordingly. Serves 2 as a main course or 3–4 as a side. Heat oil in sauté pan, add almonds and cook until light golden. Remove almonds and set aside for garnish. Reserve oil in pan, return to heat and add onion and garlic. Fry until translucent, then add cumin, coriander, paprika, chilli flakes and salt and fry until spices are fragrant. 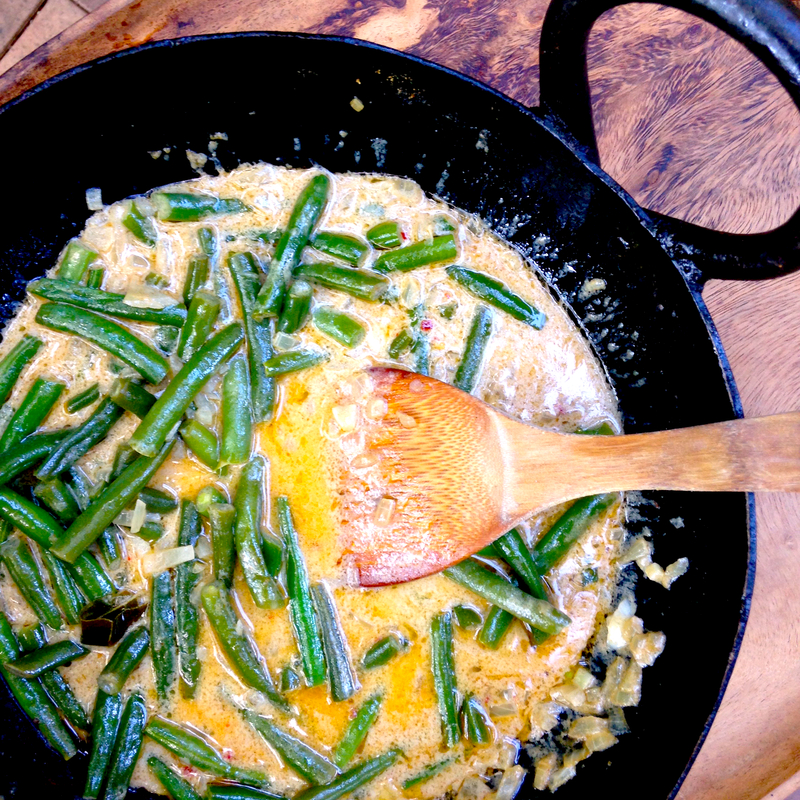 Add coconut milk, stir until combined then add green beans. Reduce heat to low, cover and simmer gently until beans are tender (about 6 minutes). Remove from heat. Add lime juice. Transfer to serving dish, garnish with almonds and coriander. Serve with plain rice or flatbread and a selection of sides of your choice. PS. Thanks for the tip on the Classic Indian Vegetarian and Grain Cooking book! It’s one of those cookbooks that remind you why you love cookbooks. Julie Sahni is better known in America, she’s never been that well known in Australia. I think the secret is to keep it simple and not get into too many ingredients you don’t know – that and stay away from the fake cheese. This sounds amazing! Thank you so much for linking up. And your dinner parties sound a bit awesome too. I’d love to be a guest! Meanwhile, paleo-vegetarian… wtf? that would drive me insane. It seems every time you blink nowadays a new dietary subculture emerges all promising eternal life and health – it’s impossible to keep up with them all. That sounds delicious! And I’m definitely with you on how a dinner party is structured – a table piled high with options is my way as well! I always over cater but that just means no cooking for a few days afterwards which I don’t think is a bad thing!